NEW YORK (AP) Former Tampa Bay pitcher Steve Geltz and three other minor leaguers have been suspended for drug violations. The penalties were announced Saturday by the commissioner’s office. Geltz was banned 100 games after a third positive test for a drug of abuse. The 30-year-old righty was on Philadelphia’s Triple-A roster. 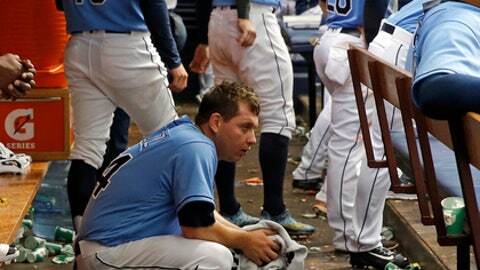 In 2015, Geltz set a Rays record by retiring 32 straight batters. He last played in the majors in 2016. In four seasons with the Angels and Tampa Bay, he was a combined 2-9 with two saves and a 4.23 ERA in 110 games, all but two in relief. Tampa Bay catcher Nick Ciuffo, on the Triple-A roster, drew a 50-game penalty for a second positive test for a drug of abuse. San Diego Padres pitcher Alex Cunningham was suspended 50 games after testing positive for Amphetamine, a stimulant. He was at Single-A. Pittsburgh second baseman Mitchell Tolman, on the Double-A roster, drew a 50-game suspension after a second positive test for a drug of abuse. There have been 16 players suspended this year under the minor league program and three under the major league program: Houston pitcher Dean Deetz, Washington catcher Raudy Read and Pittsburgh pitcher Nik Turley.